This Teej, get inspired by these unique and stylish designer lehengas and sing the song of joy while swinging away to glory! All you new brides who are looking forward to celebrating the grandeur of the Teej galore this year, you must check out these 6 gorgeous lehenga designs. 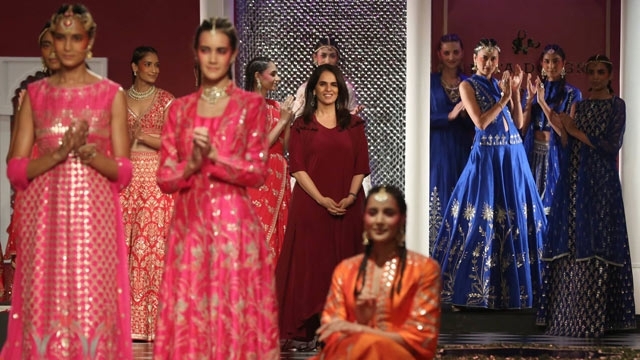 Straight from the runway of Indian Couture Week of 2016 which showcased the work of finest Indian fashion designers, who have meticulously put together a collection for to-be and new brides. From light to heavy, ethnic to bohemian, these lehengas are bespoke and reflects the personality of a modern-day bride of today! Take a look at these splendid, opulent, magnificent and elegant designer lehengas to participate in this year’s Teej festivities with a beautiful spirit. Inspired by the architecture of the fabled land of Persia, the drop shoulder blouse, no dupatta, and heavily embellished embroidery which redefines vintage. If the new bride is in love with elegance and wants to stay away from the typical bright Teej colors such as greens and yellow, then this is it! 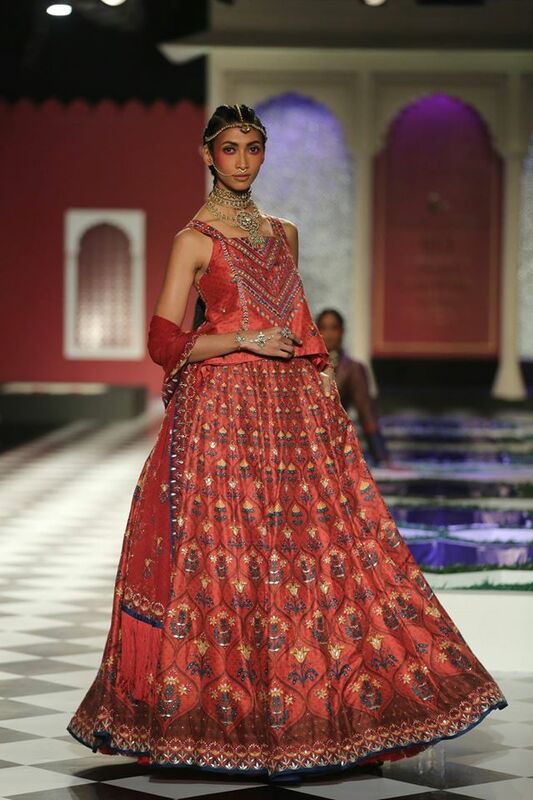 Apt for a new bride, color red can’t be depicted as beautifully as through this designer’s ace collection. So ravishing and bright and bridal, this Teej, look well-looked-after in this heavy lehenga and accessorize well for your first Teej festival. Adorned with glittering rose-motif embroidery, in hues of peach, pink and red. 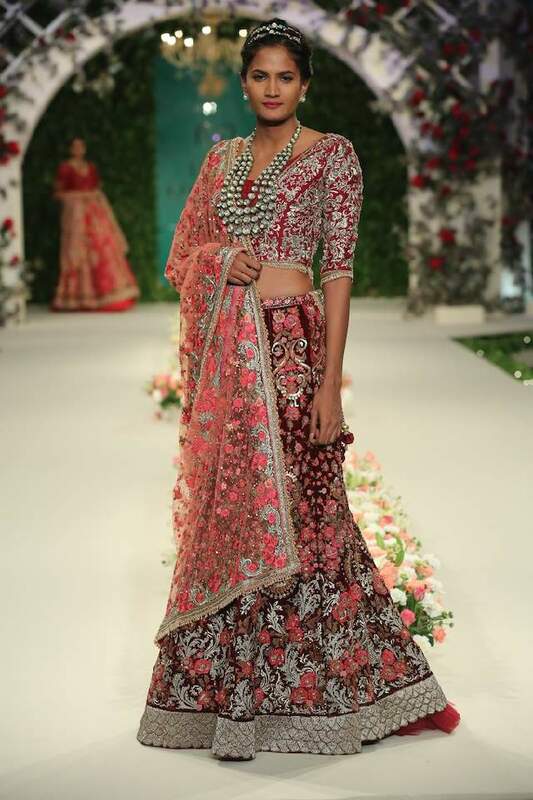 The classic lehenga silhouette with intricate lace on the choli and skirt looks gorgeous. Use of rich silk chanderi gives the attire a unique festive feel. So, this Teej, all you young brides, try out a frothy, floral number and dance away to glory! 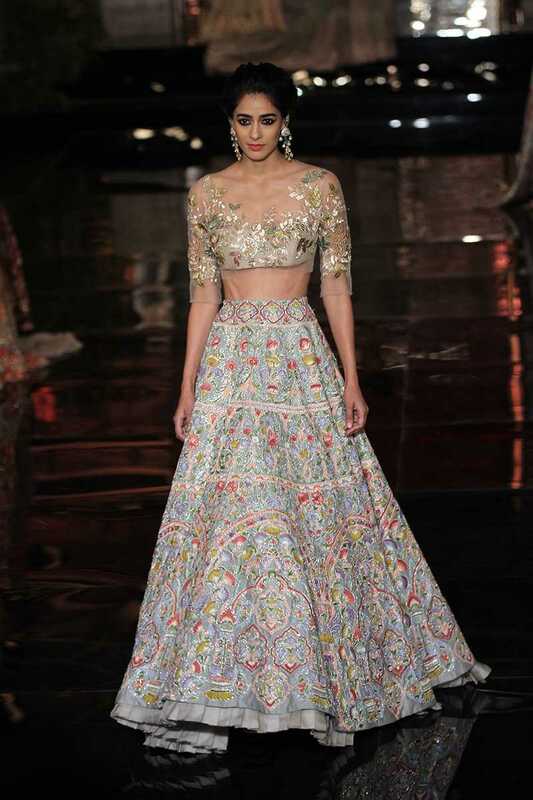 The lehenga pays homage to Indian courtesans. The designer has creatively twisted the ancient India into a piece of modern artwork. This beautiful outfit speaks of culture, poetry, dance and finesse as practiced by the courtesans. Use of artistically blended fabrics in pastels and pales with so much of lightness yet finesse. A new bride has to try this peach-pink lehenga choli and dupatta embellished with Swarovski crystals. For a modern Indian bride who loves to be a part of the festivity but doesn’t like to go overboard, here is what we recommend. An embellished lehenga that depicts the mood of floral Teej with the 3D flowers (hand weaves or intricate work of gold embroidery), sequined jacket in an organza or georgette. If you want to stay away from black, then stick hues such as white, beige, gold, salmon pink, fiery red and yellow. For our bohemian new bride who is casual and loves to sport a chic outfit on Teej or at monsoon weddings, opt for Anita Dongre’s gypsy theme. Light, versatile, wearable, smart and simple! 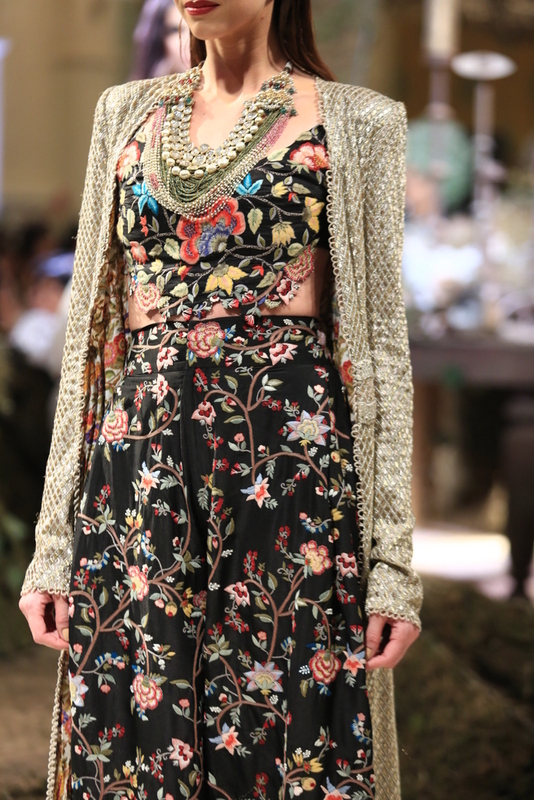 Celebrate the free-spirited girl inside you with this chintz-inspired printed lehenga, teamed with bohemian blouse. Isn’t this the perfect classic Indian style blended seamlessly with the contemporary theme that gives a beautiful illusion of height? So which design has inspired you?